Horses retire for differing reasons and have various levels of retirement. Age is one factor, but so is injury and illness. After years of attention, now is not the time to cease all activities with your horse and, in fact, some can have a second, post-retirement job suited for their current physical abilities, whether with you or someone else. Your horse can maintain a certain performance level for only so long, regardless of your high level of care. You may notice that his feet frequently bump the five-foot jumps he always cleared with ease, but that doesn't mean he can’t jump 3 feet or less. You don’t have to compete at his lower level. Instead, look for someone to lease him, an arrangement where someone pays you a lump sum to ride your horse for an agreed upon period, usually a year. They also pay all of his expenses, but you retain ownership. You also can offer a free lease, which is a good arrangement with someone you know well. In this arrangement, the other person pays all of his expenses, but no additional cash payment. Your horse may need to retire completely from his discipline, whether it’s jumping, dressage or barrel racing. However, he still may be suitable for light riding or a discipline change. In fact, exercise is good for aging horses, keeping their joints and muscles limber and strong. Just make sure it’s at an appropriate level. Your vet can help you determine the level and frequency, whether it’s several days a week of light riding, lower-level dressage instead of stadium jumping, or just occasional trail riding. If your horse has an injury that eliminates even sitting on him, such as a back or pelvic injury, he still can teach young kids about horsemanship, the basics of horse care and safety. Young kids start their horse education by learning to brush and bathe horses, and clean out their hooves. 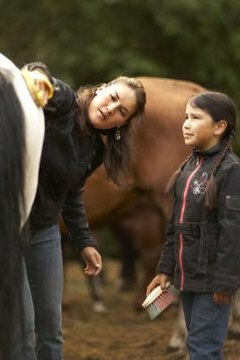 They can practice tacking up, which is putting on the riding equipment, learn how to wrap legs for certain sports or for medical reasons, and practice mane and tail braiding. Some horse camps allow children to finger paint good-natured horses. If it’s not possible for you to do this, ask your trainer if she needs a horse for this type of work. Good lesson horses are hard to find, and they typically are older, seasoned horses with a lot of riding and show miles in them. They've “been there, done that,” and not much scares them. If this description fits your horse, he might just be the horse to teach beginners how to walk, trot and, if he’s able, canter. If you don’t give lessons, contact a trusted trainer to see if she’s interested. If your horse still is in good physical condition and has a good temperament, contact therapeutic riding programs to have him evaluated. Individuals with varying levels of disabilities ride horses to improve muscle balance. It also is good mental and emotional therapy. There may be other, less physically intense programs in your area for troubled youth or combat veterans, or you can start your own program. Cowichan Therapeutic Riding Association: What Makes a Good Therapy Horse?